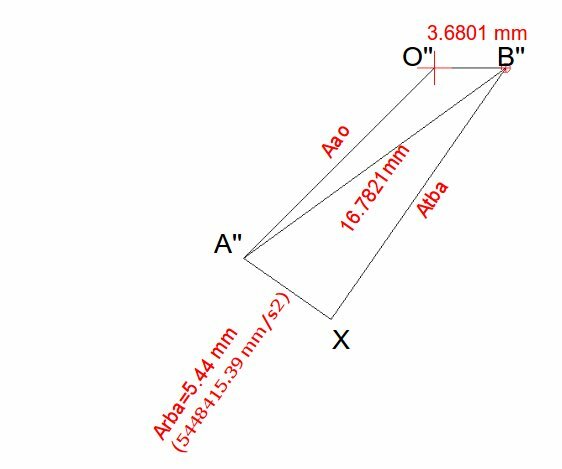 In the last article, I have discussed how to draw the velocity vector diagram for a four bar linkage mechanism. The same example I will used here as well for explaining the steps required for drawing the acceleration vector diagram for the same mechanism. Funda-1: Typically there will be two components of acceleration, radial and tangential, for any link of a mechanism. Funda-2: The direction of the radial component of acceleration is always parallel to the orientation of the link. 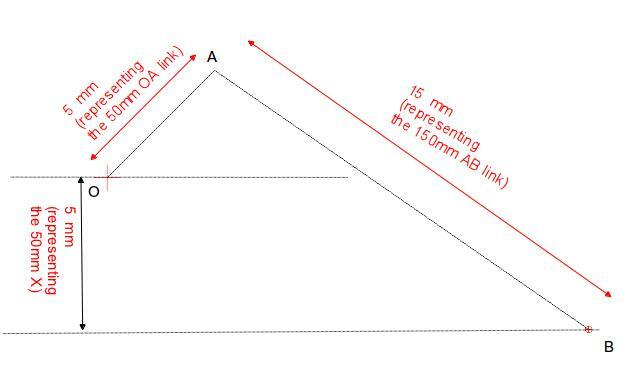 Funda-3: The direction of the tangential component is always perpendicular to the orientation of the link. Funda-4: In case the end of a link is moving at a constant angular velocity (i.e., a link hinged at one end and rotating at constant RPM with respect to the hinged point), the moving end will have only radial acceleration component and no tangential component. Funda-5: In case a joint moves along a straight line (i.e., cylinder), it won’t have any radial acceleration component. The direction of the total acceleration of the joint, in such cases, will be parallel to the line of movement of the joint. 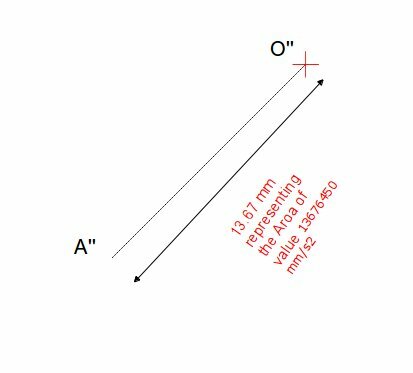 Axy – The radial acceleration of joint X with respect to joint Y.
Step-1- orientation of acceleration of link OA: The joint A is rotating at constant angular velocity (of 5000 rpm). So, according to the Funda-4 explained above, the joint A will have only radial component and no tangential component of acceleration. Also, according to the Funda-2, the radial component, in the acceleration vector diagram, will be oriented parallel to the link OA . Step-2- value of the radial acceleration component for the link OA: From the example problem statement we know the angular velocity of link OA (Wao) = 5000 rpm=523 rad/s and the length of the link OA = 50 mm. 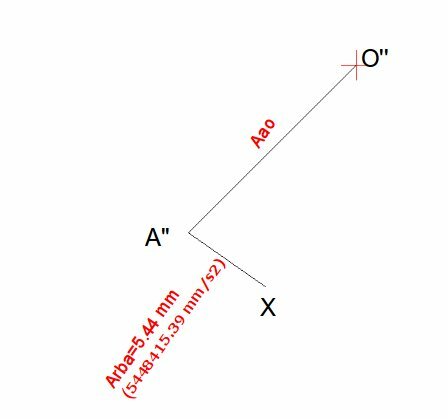 Since, there is no tangential component of acceleration for the link OA, so the Arao will represent Aao, which is shown by the vector O”A” in the above diagram. 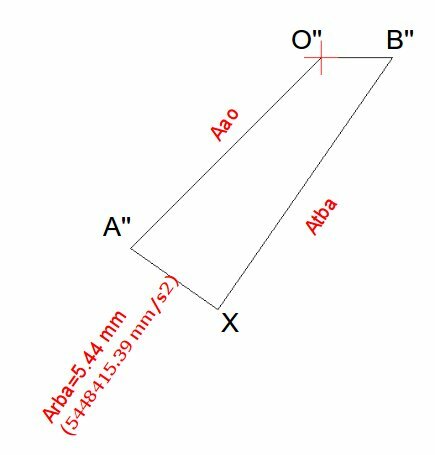 Step-4-Drawing radial component of acceleration of joint B with respect to A (Arba) for the link AB: Draw a line starting from the point A” till the point X of the acceleration diagram and oriented along the link AB of the space diagram. the values of Vba and BA can be obtained from the previous article. 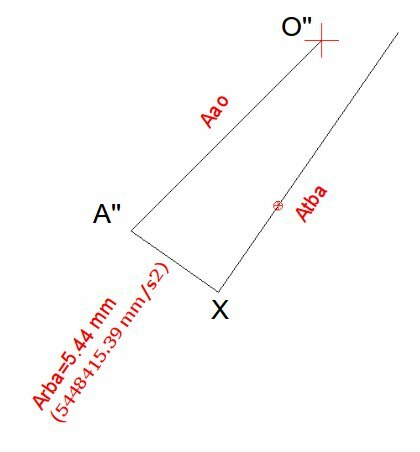 The scaled value of the Arba becomes 5.44 mm (remember scale factor = 0.000001). Step-5-Drawing tangential component for the link AB: From the Funda-3 we can say that the tangential component of the acceleration will be perpendicular to the radial component. But, as of now,we don’t know the value of the tangential component (Atba) of acceleration for the link AB. The Line O”B” represents the total linear acceleration of the slider B with respect to joint-O. Step-7-Calculating the output acceleration values: The length of the line A”B” and O”B” will represent the linear acceleration of the joint B with respect to the joint A and the linear acceleration of the joint B with respect to the joint O respectively.